We’ve been selling legal weed for four years! Isn’t that crazy? This is all starting to seem like a regular job, one where our staff feels like a family thanks to all these successful years together, and even though this’ll sound cheesy, it’s all because of you, our customers. Some of you are regulars who’ve been coming in since day one, and some of you are first-timers who remind us how exciting legal cannabis can be with your smiles when you walk in. Either way, we wouldn’t be here if it wasn’t for our customers, so, we’re going to do something special for you on our anniversary. Usually, the traditional gifts for a fourth wedding anniversary are linen, silk, fruit, and flowers, and in a way, we’re married to our customers because we couldn’t live without you guys. That being said, we’re not going to give you linen, silk, or fruit because that would be a weird gift from a weed shop, but the “flowers” we sell are a different story completely. 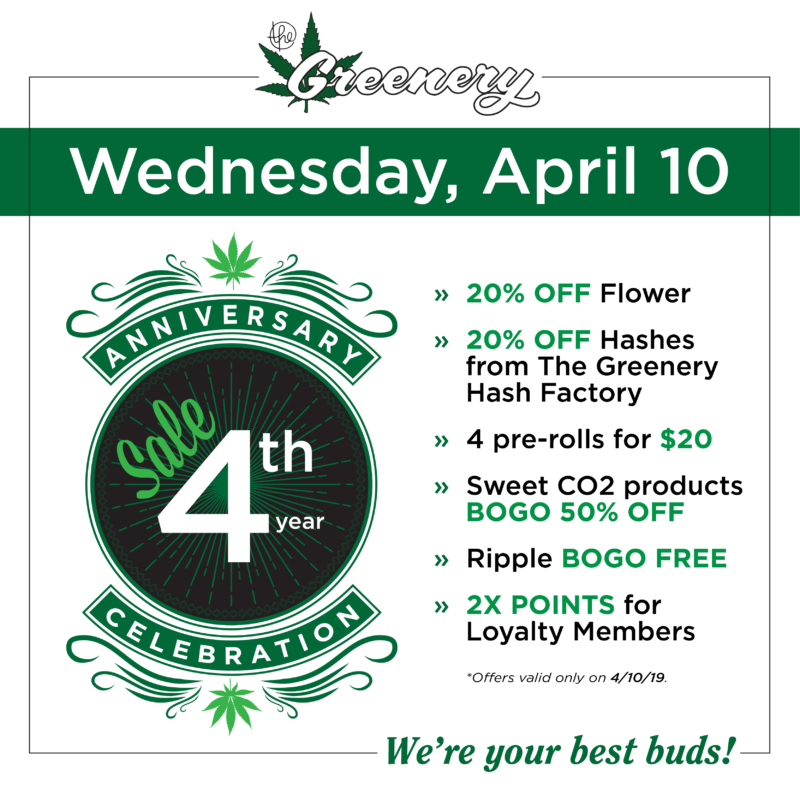 So, this April 10th, for the fourth anniversary of our Durango dispensary, here are the deals we’re giving to our customers to say thank you, and happy anniversary! 1.) All flower will be 20% off (see what I mean about flowers?). 2.) All concentrates will be 15% off (because our anniversary falls on Waxy Wednesday, which is awesome). 3.) All solventless hash from The Greenery Hash Factory will be 20% off. 4.) All Sweet products will be buy one, get one 50% off. 5.) For our anniversary, you’ll be able to buy four, one-gram pre-rolls for $20 (limit: one time per customer). Since it’s our fourth anniversary, “four-for-twenty” sounded perfect. 6.) If you haven’t signed up for our Loyalty Program, you need to, because during our anniversary party, all loyalty customers will receive double points. 7.) We’re also running a spectacular deal on one of our edibles, buy one, get one free on all Ripple products. See? We love you guys a whole bunch, so we went a bit crazy with our deals. We’re even gunna have our favorite radio station X-Rock here doing a live broadcast from our parking lot, we’ll be giving out swag while it lasts, and I’m sure balloons will be involved somehow. We can’t tell you how much we appreciate your business over the years, so we’re going to do our best to show it, because even though I usually end these blogs with “We’re Your Best Buds,” the truth is that You’re Our Best Buds!